At long last, after many days spent waiting and watching out of the window for the parcel delivery van, the plane that we ordered from Amazon.co.uk arrived, (Wolf 900w 3Bladed Rebate Planer). The wooden doors to all of our rooms in the house had been piled up against walls, here, there, and everywhere, waiting to be shrunk to size, because of the extra thick carpet and underlay that we’d had fitted. With the much needed plane in our possession we got straigth to work in the back yard. For a workbench we had an old kitchen unit that had been chucked out in the yard a few days ago. It wasn’t an absolutely ideal workbench, but more stable and definitely better than the other option, which would have been balancing the doors on some old dining chairs. Before I got busy sanding, I measured the door jams, marked up the doors, and then Mrs. R and I took the doors outside into the backyard. Mrs. R held the doors steady on the ‘work bench’, while I got on with the planing. It was a dirty, and very noisy job, but a job well done, and after a couple of hours all six doors were planed to size. Rehanging the doors was a slightly harder job than the planing. Who ever had hung the doors previously, had done a bad job. Screws were odd angles, badly cut hinge groves etc. which was a real pain for rehanging the doors, and meant it took us longer than we wanted. Two of the ground floor doors weighted a ton, as they are hardwood frames with thick heavy large glass panels, so this too meant rehanging them took us quite a while. After hard toil, and turning the air blue, we had finally rehung all of the doors. It’s not a job either of us are eager to repeat. This entry was posted in House Renovations. 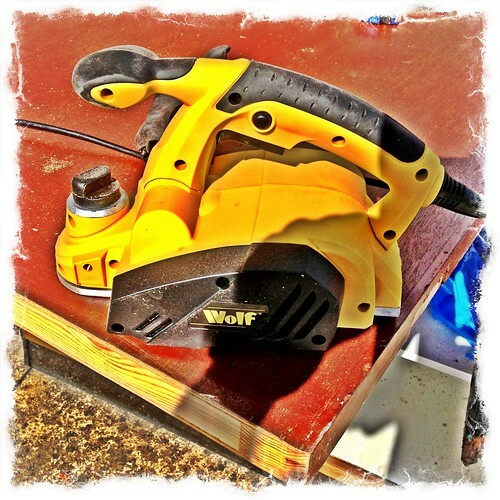 and tagged plane, planing, Wolf 900w 3Bladed Rebate Planer on September 17, 2013 by Richard.